Robert Luff & Co are delighted to offer this three storey semi-detached house situated in the sought after West Park area of Goring. There are comprehensive local amenities including shops, schools and bus routes. The sea can be found in around 3/4 of a mile and mainline railway station serving London, Brighton, Portsmouth and Southampton can be found around 1/2 mile away. 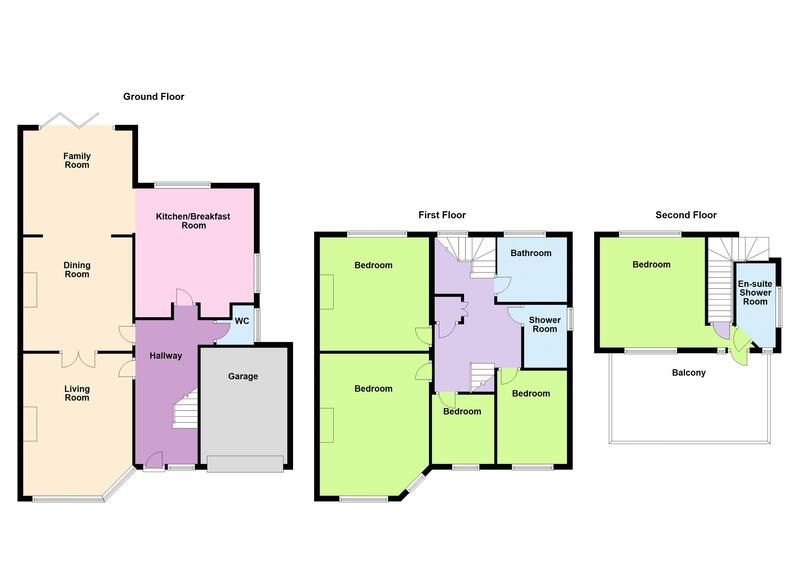 This extended house has three reception rooms, modern fitted kitchen/breakfast room and cloakroom/w.c. on the ground floor, four bedrooms, bathroom/w.c and shower room/w.c on the first floor and on the top floor the main bedroom with en-suite shower/w.c and West facing roof terrace. There are front gardens, driveway and garage and landscaped rear garden with large Summerhouse. Internal viewing is essential. Smooth ceiling with coving, smoke detector, wall light point, radiator. Close coupled low-level w.c, obscured double glazed window, wash hand basin and cupboard below, smooth ceiling. Measurements to include built in units. Range of units and drawers, double sink unit, built in oven and microwave, dishwasher, corner carousel unit in one corner, island unit with 5 ring hob and extractor hood over, pan drawers, large radiator, part tiled walls, space for American fridge/freezer, refuse cupboard, underlighting to top units, two double glazed windows. Storage cupboard, smooth ceiling with smoke detector, radiator, double glazed window. Two double glazed windows, radiator, TV point, smooth ceiling. Double glazed window, radiator, smooth ceiling with coving. Double glazed window, coved and smooth ceiling, radiator. Panelled bath with shower attachment, close coupled low-level w.c, part tiled walls, obscured double glazed window, floating sink unit with mixer tap and shelves below, heated towel rail, smooth ceiling with spotlights. Walk in double shower unit with walll mounted shower unit, close coupled low-level w.c, pedestal wash hand basin, obscured double glazed window, heated towel rail, smooth ceiling. Wall mounted gas boiler, smooth ceiling with spotlights. Two double glazed windows giving double aspect with views to the downs and over the roof tops of Worthing, smooth ceiling with spotlights. Step in shower cubicle with shower unit, large drench head and mixer, close coupled low-level w.c, floating sink unit with mixer tap and drawers, two double glazed windows, heated towel rail, smooth ceiling with spotlights. with astro turf, retaining walls to two sides and railings to other, with views over surrounding area. Laid to lawn, flower and shrub borders, driveway to garage, side gate to rear. with electric up and over door, electricity meter and electric circuit board fuse box, power and light, utility area to rear with plumbing and space for washing machine and dryer, double glazed side door to rear garden. raised patio directly to the rear of the property, with water tap and brick shed, storage, step down onto lawns with flowers and shrubs, sunken trampoline, decking to rear with space for hot tub and to the other side wooden shed. power and light, double doors onto garden and opening window, with canopy porch to front.